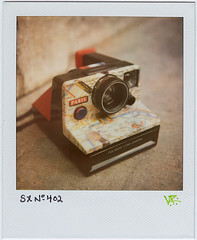 This photograph is a test shot using the custom-made PolaCity Paris Model Pronto SX-70. 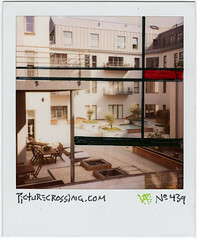 It was shot from my balcony in Mons, Belgium showing the courtyard next door on 4/27/10. These pictures with an "X" number are rare among my images and denote that they were taken with a camera I was only experimenting with. I also drew a deStijl design on this one in black and red forming a relationship with the architectural elements in the photograph. 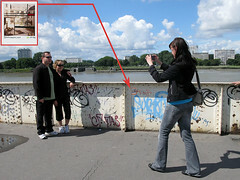 LEFT: this picture was left in Antwerp, Belgium on 8/28/10, on the Wandelterraszuid (a scenic boardwalk) along the Schelde river near Steenplein. (click the photo below to find out more about where it was left. I found picture 439 in Antwerp... on the walking terrace near the river “Schelde” and near the monument “Steen”.I found it the second week of september. I no remember the day exactly. PX No.389 "Rembrandt vs Magritte"